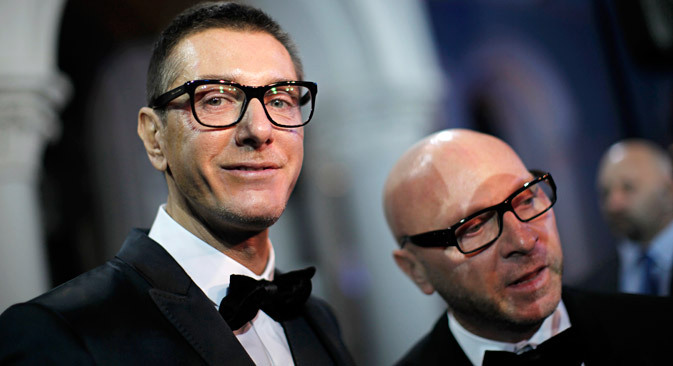 On a recent visit to Moscow, Domenico Dolce and Stefano Gabbana talked with RBTH’s Inna Fedorova about Russian women, their love for beauty and what Russia has common with Italy and how it is different. Russia Beyond the Headlines: This is not your first visit to Moscow. What changes have you noticed? RBTH: Of course Russians think that Russian women are among the most beautiful in the world. I think we all agree that despite all the changes, Russian women are still among the most beautiful. How do you understand the phenomenon of Russian beauty? RBTH: What would you say about the way Russian women dress? And what about Russian men? RBTH: Russian people are buying more and more stylish and expensive clothes now. What perspectives do you see for the Russian luxury market? RBTH: How do you feel about style "a la Rus"? Have you ever had plans to create something in the Russian style?